"Apple Music supports SD cards on Android. What about iPhone? I have an iPhone with 16GB memory and wondering whether there is a way to download my Apple Music to an SD card so I can run my apps normally. Is there any method to do that?" Apple updated its Apple Music app for Android users in 2016, adding a new feature that allows them to save downloaded songs to an SD card on compatible smart phones, but not for iOS users. In this way, it seems that Android users can potentially have access to more music than iOS users who are limited to a maximum of 128GB of storage on iPhones and iPads. But actually, iOS users can also move Apple Music to SD card. This tutorial is going to show you a particular method to copy and transfer your Apple Music to an SD card for both iOS and Android users besides the regular way to save Apple Music to SD card by the Apple updated feature. The whole article will be divided into two parts. The first part is for Android users only, and the second part is suitable for both iOS and Android users. 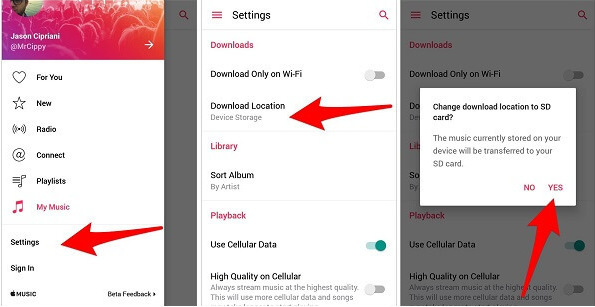 Here is a detailed guide on how to save Apple Music to SD card, benefiting by the updated feature of Apple Music App for Android. Step 1: Launch Apple Music and tap menu icon at the upper left corner > click on "Settings". Step 1: Click "Download Location" option below the "Download on Wi-Fi", then click "Yes" on the pop-up window to select SD card from the list you want to save. Step 3: Accept the prompt when asked if you want to move all of your currently downloaded music, along with any future music to your SD card. As we all know, Apple Music is a streaming music service offering DRM-protected songs, for which we are limited to listen to Apple Music tracks on iTunes or with Apple Music App. But the following part is going to break it through and get rid of its' limitation. The default setting of Apple Music is to be downloaded to iOS devices, and thus it’s impossible for iOS users to directly save Apple Music to SD Card. But we may seek for an “agency” to achieve it and the most amazing thing is that the “agency” will not only copy our Apple Music to SD Card, but also enable us to play Apple Music offline with our default media player, which is also suitable for Android users. 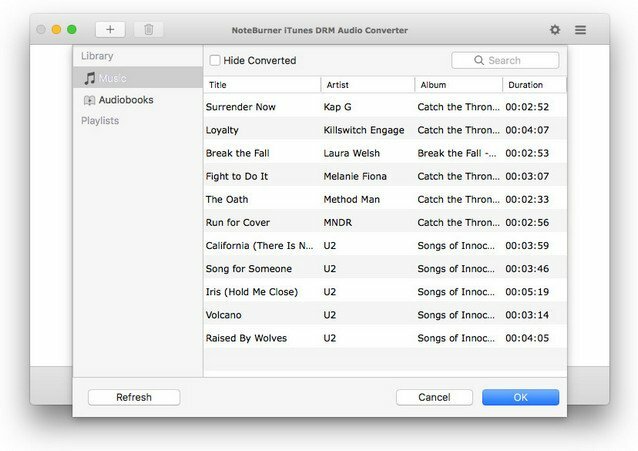 NoteBurner Apple Music Converter, a professional DRM removal for Apple Music, Audiobook as well as iTunes M4P music, is the perfect "agency" that we mentioned above. It can remove the DRM from Apple Music and convert Apple songs to common formats (MP3/ FLAC/ AAC /WAV). 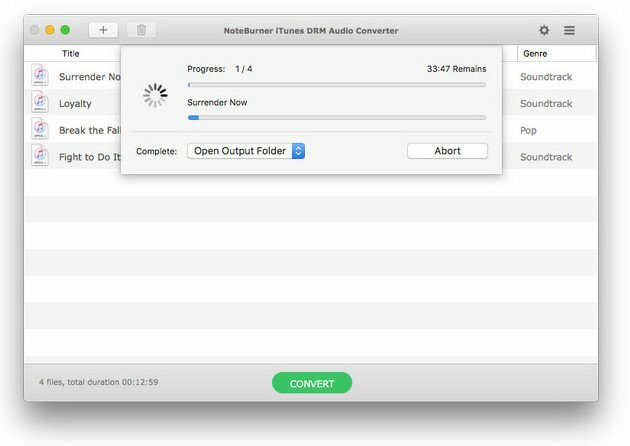 With NoteBurner Apple Music Converter, we can easily download and copy Apple Music to an external SD card or anywhere else. Now we are going to guide you on how to move Apple Music to SD card with NoteBurner Apple Music Converter step by step. Before we get started, please make sure you've downloaded and installed the program on your computer (Mac/ Windows). Otherwise, please click on the links below to finish the setup. Launch the program. Click button "+" on the upper left. 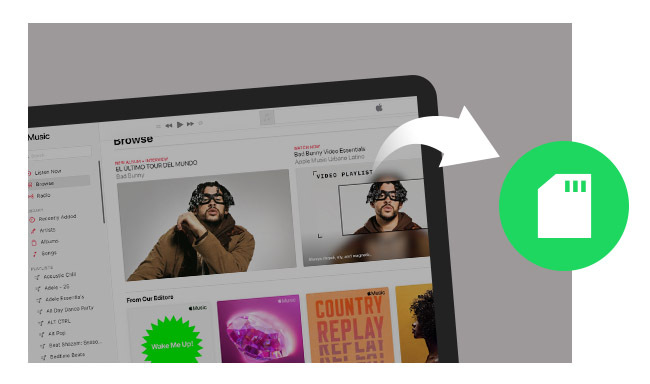 A pop-up window will show you all of the songs you've downloaded in your iTunes library. Choose the songs you like for converting and then press OK.
Click the gear button on the upper right of the interface. There will be a pop-up window to allow you to choose output format (MP3/AAC/FLAC/WAV), output quality, conversion speed(1X/5X/10X/20X) and output path. Click button “Convert” and then you will see the progress bar of the conversion. When they are all done, click the menu button (three lines) on the upper right of NoteBurner Apple Music Converter. Here you can find all the converted DRM-free songs that have been converted successfully. Now all the songs you get are in DRM-free format. Insert the SD card into your computer's built-in card reader, and locate the folder your saved your converted Apple Music, and then copy and paste them to your SD card. If your computer does not have a SD card adapter slot, you may insert an external SD card reader to help. 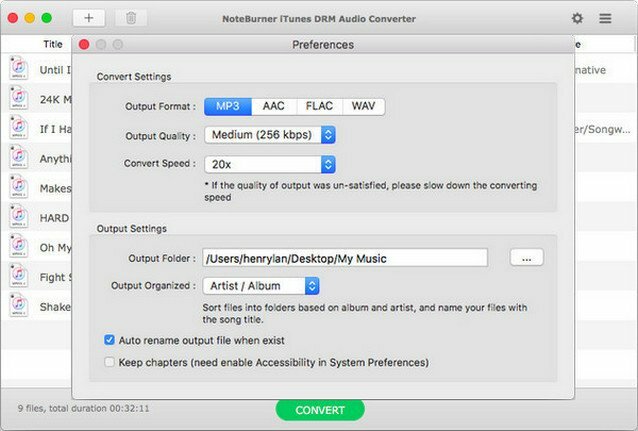 Note: The free trial version of NoteBurner Apple Music Converter allows users to convert the first three minutes of each audio file. To unlock the time limitation, we can purchase the full version of the program ($39.95).